PepsiCo and Coca-Cola both topped forecasts, boosting their stocks to new highs. Shares of PepsiCo (PEP) rallied 5% to a new 52-week high Thursday after the maker of Pepsi, Fritos and Doritos (among other snacks and beverages) reported a 12% jump in earnings per share as sales rose more than 4%. While its North American beverage business appears to have hit a speed bump, CEO Indra Nooyi remains confident the business is on track to meet expectations this year. The company attributed some of the beverage volume decline to pricing decisions. Nooyi said the company will continue to explore "sensible opportunities" to boost value. Meanwhile, Coca-Cola also beat earnings per share by a penny earlier this week, and said the restructuring of its U.S. bottling system was ahead of schedule. Shares of Coca-Cola (KO) were down slightly Thursday, perhaps due to a Barron's report saying the stock was looking expensive. But shares hit a new 52-week high just yesterday. Slow and steady wins the race. Take a look at the year-to-date chart and it's been a nice steady climb for both beverage makers. 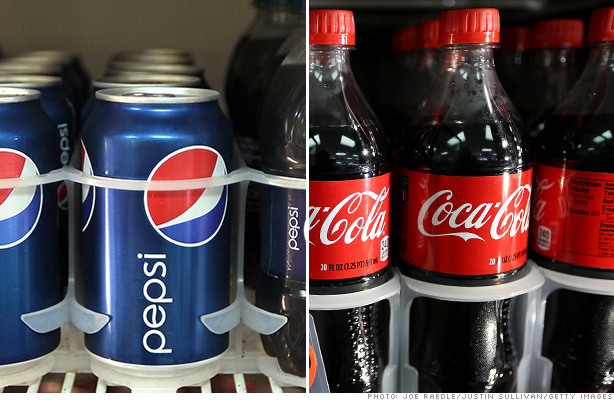 Shares of PepsiCo and Coca-Cola are up a not-too-shabby 16% and 20%, respectively. StockTwits traders weren't rolling out the red carpet just yet, but most were cautiously optimistic. It's true that PepsiCo's beverage business is still lagging rival Coca-Cola, but as I noted above CEO Indra Nooyi remains optimistic. "Expect us to continue to play a responsible game in North American beverages to be competitive," she told analysts. "Across the beverage business, we are taking out costs to drive margin and improve returns." Wouldn't you like to be a Pepper too? $DPS up 1% and near 52-week high. Will its earnings next week be as strong as $KO & $PEP? $PEP up 5%! Ooooh, ooooh, ooooh! That would be a trifecta! Haha. I like the way you think ivanhoff. Verizon also beat EPS forecasts. And even though iPhone activations slipped from the fourth quarter, they were still up year-over-year. And speaking of defense, let's not forget about Coca-Cola. Though it doesn't seem as though traders are quite as enamored with the brand. I'm not sure I'm ready to agree. Sure, Barron's thinks Coca-Cola is too pricey, and at 19.4 times projected earnings, it is a little on the high side. But it's not astronomically high. I have to agree that Europe and China are still turbulent headwinds so we may see some pullback.